With the days growing shorter and the first blush of fiery color on the hillsides, it’s clear that fall-and the upcoming school year-are fast approaching. There are 3 essential parts to the equation when it comes to helping your child bring his or her A game to school: Nourishing food, good hydration, and adequate sleep are the secrets to never running on empty. Most kids fall short in at least one of these areas...and some fail to make the grade in all three. Today I'm tackling the one that I think often gets shortchanged: hydration. Many reasons, actually. For peak energy. For a healthy weight. For optimal focus in school. For better performance on the sports field. Oh, how to count the ways. The best way to keep your child well hydrated, of course, is to encourage them to drink plenty of it, and to make it a mainstay of their day: as this fun infographic from the USGS Water Science School illustrates, water comprises about 60% of a persons body weight (and even a bit more in children). Yet while that prescriptions sounds simple, in this era of sugar sweetened beverages, juice drinks, energy drinks and even enhanced waters (many of which contain calories or artificial colors), new evidence from the most recent NHANES data suggests that virtually no demographic of children in the US comes close to satisfying the Institute of Medicine’s recommendations for water. Like I said, shortchanged. 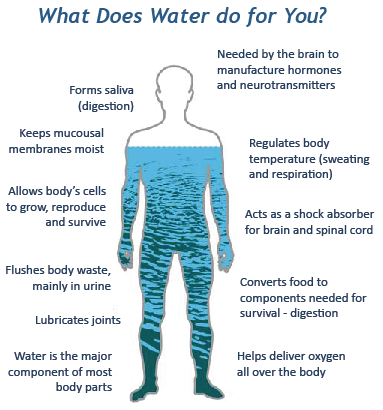 Here’s why water is the purest way to hydrate: It has zero calories, which helps promote a healthy body weight. And with a new science suggesting that drinking soda does more than just pack on the pounds, but may contribute to negative mood and behavior in young children as well, sidestepping sugary beverages makes especially good sense until we know more. In the classroom, water helps your child have sustained energy for the task at hand: research suggests that as little as 1.5% dehydration can lead to a decreased positive mood, sluggish energy, as well as a reduced level of alertness, concentration and short term memory. On the sports field, water helps to regulate body temperature and maintain maximum muscle strength (a 3-4% dehydration reduces muscle strength by about 2%). Simply put, smart sipping literally means keeping your water bottle on hand for regular drinking throughout the day. And did I mention it's free? Here are the daily water recommendations from the Institute of Medicine’s Dietary Reference Intakes. How does your child’s glass stack up? Keep in mind that things like higher elevation, temperature and humidity can also increase your fluid needs. Ultra Quick Hydration Check: In children, thirst is not a reliable indicator of hydration status, because they can be distracted or their thirst mechanism may not be fully formed. And by the time we actually receive signals from our body that we are thirsty, we are already dehydrated, which means we’re behind the eight ball and not performing at our best mentally or physically. For a quick check, check the bowl: urine that’s light in color (like lemonade) with no strong smell indicates good hydration, while urine that’s darker (like apple juice) and has a stronger smell is a sign you need to drink up. Use a BPA Free Reusable water bottle-reusable bottles help you save hundreds of dollars a year that you’d spend on bottled water. And it’s a much more eco-friendly choice. There are many fun children’s versions with leak proof lids that fit in lunchboxes and sports bags. I love the CamelBak line (Disclosure: I am a proud partner with CamelBak). Chill it to drink more. Research suggests that we drink more water if we find it cool and refreshing. Pop your reusable water bottle in the fridge or add ice if you prefer it chilled. Serve water with meals and snacks. In addition to the 3 servings of low fat milk or enriched non-dairy milk alternatives (like soy, almond, coconut or hemp) that the USDA Guidelines recommend for children each day, be sure to also put water on the tables for meals and snacks. This will help them cultivate healthy drinking habits for life. For some fresh and easy lunchbox ideas check out my Deliciously Different Lunch Ideas Your Kids Will Love, and bookmark Chef Ann Cooper’s incredible stash of easy, inspiring lunches that will keep your kids fueled all year. As for sleep, health experts recommend 10-12 hours per night for children ages 3-12, and 8-9 hours per night for children ages 12-18. Have other tips to help your child bring their A game this fall? I'd love to hear them!